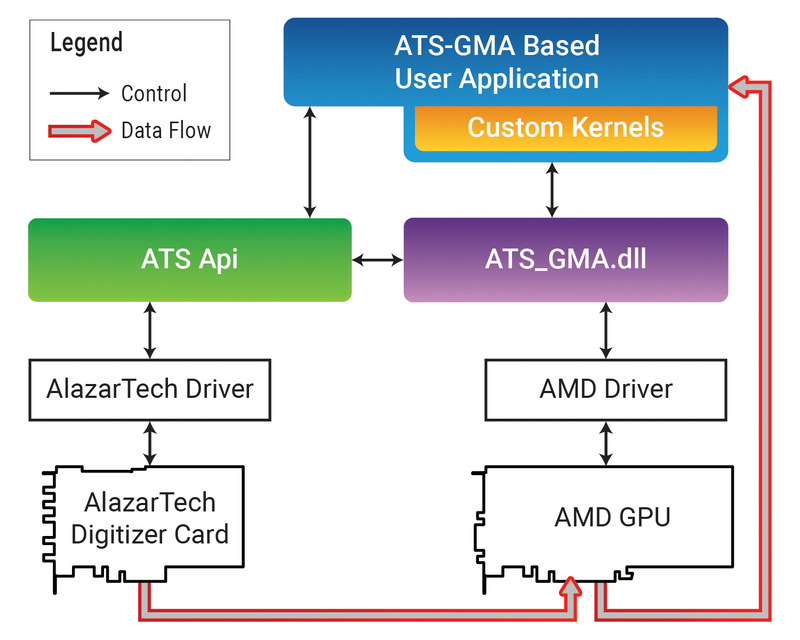 Montreal, Canada (March 23, 2018) AlazarTech, a manufacturer of high-performance, low-cost PC Based Instruments, today announced the release of ATS-GMA™, a software library that allows users to DMA data from its PCI Express waveform digitizers to AMD Radeon™ Pro Graphical Processing Units (GPUs) at rates up to 6.9 GB/s with latency as low as 100 μs. Though the powerful processing capabilities and high-speed graphical memory bus make GPUs perfectly suited for signal processing applications, direct DMA from hardware devices to the GPU’s on-board memory can be problematic. In the case of a waveform digitizer, users must manually copy data returned from the waveform digitizer buffer to the GPU, which causes a drastic reduction in overall data throughput. A commonly used alternate approach with NVIDIA® GPUs is to use CUDA® streams to overlap multiple buffer transfers. This method increases the transfer speed to approximately 5 GB/s, but suffers from large data latency. ATS-GMA solves both these issues by enabling the DMA of data from AlazarTech PCI Express digitizers to compatible AMD GPUs without any CPU involvement. An added benefit of this approach is that data becomes available in GPU memory with very low latency. The initial release will be ATS-GMA-BASE™, which includes a sample program that demonstrates how to use the ATS-GMA-BASE library to do simple data processing and DMA data from AlazarTech PCI Express digitizers to compatible AMD GPUs. In the coming weeks, AlazarTech will also release add-on libraries that allow users to perform additional signal processing on data captured into GPU memory by ATS-GMA-BASE. ATS-GMA is compatible with Windows® 10. ATS-GMA-BASE includes a sample program written in C/C++ source code, which implements very simple GPU kernels that invert data and write it back to a buffer in computer memory. “We heard from many customers that they would like to see the waveform digitizer as the analog front-end to a GPU, so researchers can quickly and easily develop and enhance real-time signal processing algorithms to innovate”, stated Muneeb Khalid, President of AlazarTech. “We developed a true digitizer-to-GPU DMA hardware and software solution that does exactly that and also offers the lowest latency of any product on the market”. ATS-GMA is available immediately from stock. U.S. prices start at $995 in single quantity. Volume discounts are available. International prices may be higher.